I have a new addiction. Fireball Apple Cider Cocktail. Remember those hot cinnamon fireball candies we ate as kids? Well, there is a vodka called Atomic Hot, and it is fabulous!! 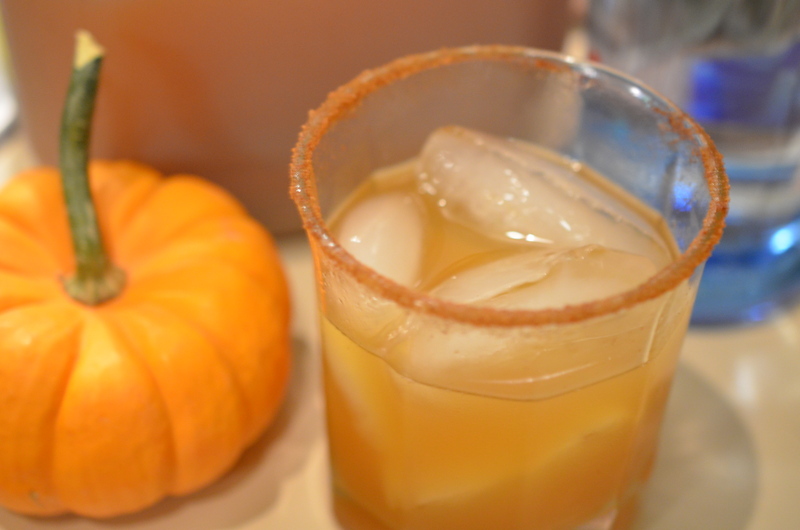 The first thing you want to do is rim your glass with a cinnamon sugar mixture. Fill with ice and add a good shot of this deliciousness! Top off with apple cider and enjoy! This would make a great holiday drink to serve your guests. And, if you like hot apple cider, just pour the vodka and cider in a mug and pop it in the microwave for about 45 seconds. Perfect for a cold chilly night! Today was a good day to stay home and make soup. It wasn’t all that cold here but the wind just seemed to go right to the bones and chill me to the point I could actually wear a turtleneck and gloves! So I made soup! I made my usual chicken noodle soup but decided with the chill of my bones, I wanted to make it a little more heartier, so I made it creamy…without the milk or cream though. I chopped about 1/3 cup of carrots into very small pieces, and about 1/4 cup of onions. Tossed them in a pot with some olive oil and sautéed them until they were just about tender. Then I poured in a 32oz carton of chicken broth/stock. Shredded about 1 cup of chicken that was left over from a Buffalo Chicken Dip that I made. And man oh man was that delish! I’ll post that later. Anyway, after the chicken I put in a good handful of noodles, about 1 cup. While that was coming to a simmer, I decided to make it creamy. So I put a very big heaping tablespoon of flour in a small jar and added enough water so that when I shook it, it was the consistency of a gravy. Once the soup was simmering and after the noodles were al dente, I slowly added about half of the flour mixture and stirred it well. I waited a few minutes to decide if I wanted to add more, which I did. turn the heat on a low heat, let it cook for a few more minutes while you chop some kale into small pieces. Add the kale and turn off the heat. Slice your crusty bread, pour your wine and get yourself a big bowl of soup!! Hope you enjoy this soup as much as I did today!